The outer layers of our skin are home to dermatophytes, tiny organisms who are mostly harmless, but in some cases can cause nasty looking conditions known as ringworms. The condition is not really caused by any worms and there is nothing going on under the skin. Ringworms are completely on the surface and are a form of fungal infection. Such fungal infections are fairly common and can happen to just about anyone, but you will want to get rid of ringworm on your face as soon as possible. While no one is completely safe, people who have weak immune systems due to various diseases such as AIDS or Leukemia or who live in very humid climates which promote fungal life are under much greater risks. Ringworms are fairly harmless conditions in most cases. Usually, you can leave a ringworm on your face without attending to it at all for quite a while, but you will still want to remove it, if even just for esthetical reasons. 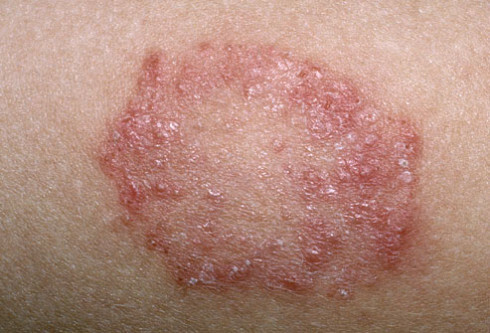 What is more, there is certainly a possibility of a ringworm getting further infected as your skin becomes more inflamed and irritated, which can lead to further complications. 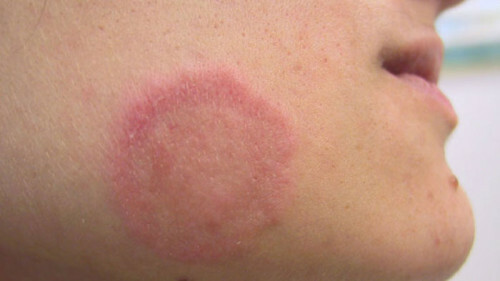 If you have developed a ringworm, worry not. There are quite a few ways you can alleviate this condition and remove the ringworms. Here are a few of the best tips to remove ringworms on your face. Honey: Using honey is one of the simplest and most natural ways to get rid of ringworm on your face. Getting rid of a ringworm using honey will work because honey contains hydrogen peroxide as well as other compounds that inhibit the development of fungi. Use a sterile pad and apply some honey to it. Then apply the pad to the ringworm and possibly cover it up with a sterile bandage to keep it in place for a while. The honey will help alleviate or completely remove the ringworms. Aloe Vera: Another natural cure that will help alleviate ringworms, Aloe Vera will help alleviate the itching and inflammation because it contains resin, which is a natural compound extremely effective with such conditions. Using Aloe Vera several times per day on your ringworm will eventually remove the infection altogether. Nail Polish: While it is certainly not something you will usually use for medical purposes, nail polish is actually very effective against ringworms. The simple way in which it works is by suffocating the fungus that cause the ringworm in the first place and your body automatically sheds the ringworm once the fungi are gone. Take a single scoop of clear nail polish and apply it to the affected area. Do not dip twice so as not to contaminate the nail polish and allow the polish to dry up on your ringworm. Leave it on for 8 hours, remove, and reapply until the ringworm is gone. Garlic: Yet another remedy that can be bought on the market, a simple paste made of garlic and some olive oil is great for getting rid of ringworms. Leave the paste on for about two hours, but not longer, as garlic can irritate the skin if left for too long. Rinse with warm water and re apply after some time, until ringworm is gone. Lavander Oil: A little less common in people’s homes, lavender oil has powerful anti-fungal properties, which can serve well in killing off the fungi responsible for your ringworm. While lavender oil does not prevent fungi from developing it does kill them and will serve great for already formed fungal infections and will help get rid of ringworms on your face. Over The Counter Medicines: There is also plenty of over the counter medications you can get for fungal infections including ringworms, all of which fight to either prevent creation of or kill of the fungi that create these conditions. Medicines such as Lotrimin AF or Miconazole Nitrate are extremely effective in removing ringworms and if hoe remedies fail, feel free to ask your pharmacist. If none of these have worked, you should certainly do see your physician, but in the majority of cases one of the remedies we mentioned will work to remove the ringworms and the choice is basically yours as most of them work quite well to alleviate your situation.